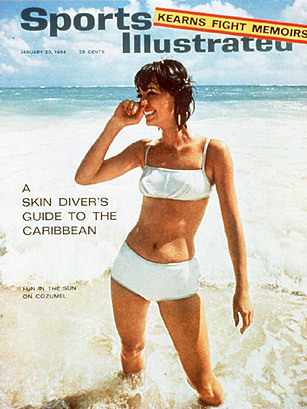 In 1964, Sports Illustrated debuted what would soon become its undeniable cash cow: the Swimsuit Issue. Gracing the cover of the magazine was Berlin-born fashion model, Babette March, wading in the surf on Cozumel, Mexico, in a white bikini. By today's standards, the suit is hardly scandalous, but at the time March's bikini caused a sensation. Sports Illustrated readers wrote in to the magazine with date offers and marriage proposals to the model. Since then, the Swimsuit Issue has not only sold millions each year, it has also become an American pop-culture staple. We doubt a one-piece would have had that kind of power. See "Reading the Swimsuit Issue for the 'Articles.'" Next Raquel Welch's Fur Bikini in One Million Years B.C.